For more information about the revaluation process, please download this helpful pdf. 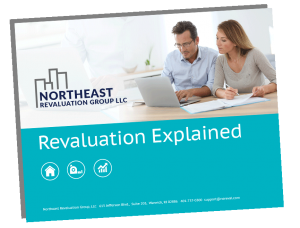 Taxpayers and Assessing Departments throughout Southern New England know they can count on Northeast Revaluation for accurate information and timely responses. Our services include technical and programming support that provide assistance with software reports, training, IT coordination, and custom programming. We work hard to maintain a customer service culture that is among the most respected in the industry. Our services include web hosting your database at our website, making it easy for taxpayers and the appraising professionals to obtain accurate information about every property in your municipality 24/7. Highlights include a concise, printable, single page internet property record card that includes the sketch, picture and other traditional information. In addition, the Northeast website updates sales ownership information daily. Northeast Revaluation Group has teamed up with Patriot Properties to offer our customers AssessPro. Patriot's AssessPro CAMA software is the most versatile and comprehensive assessing product available. It is currently installed in 19 states, covering over 6.5 million parcels. Patriot Properties, Inc. has been in business over 25 years and serves approximately 229 clients nationwide. AssessPro offers real estate and personal property software integrated in one package, including embedded GIS links using the latest ESRI technology. A dedicated and well trained team is the cornerstone to our effective revaluation work.